There has been no wittier character on TV in recent memory than Californication’s Hank Moody. For those who aspire to supercharge their wit, charm, and verbal skills, Hank Moody is a perfect model to aspire to. When was the last time you had this type of “conversation” with someone? Wow, that was painful. Yet, we continue to have these non-connecting conversations over and over, like a recurring nightmare. Am I right? Now, Hank NEVER has this type of conversation with anyone. If you watch him closely, you will see that he NEVER utters the words “Hi” or “Hey” or “Hello”. His greetings are ALWAYS non-generic. It takes creativity and effort to come up with so many different ways to say the most mundane thing (like hello), but if we want to excel in verbal skills, the bar has been raised. At 0:54 and 1:09 in the video, you will find examples of non-generic, creative greetings used by Hank to address others. If you have any creative ideas to say hello or hi without using those words, please share them with everyone in the comments! If you’ve followed me for any amount of time, you will know how much I emphasize the importance of incorporating metaphors and figurative speaking into our daily conversation. Again, metaphors are a type of “wrapper” by which we deliver an argument or statement in a way that people are less likely to reject or ignore. And, by doing this, we are more able to influence others when compared to direct/literal arguments or statements. Now, Hank Moody uses a specific type of metaphor more often than other types of metaphors, which is the pop culture metaphor or the pop culture reference (there is one other type, which you can read about in The Hank Moody Guide To Wit, which you will learn more about below). Having said that, using pop culture references/metaphors is an advanced verbal skill as it does require a certain amount of knowledge about pop culture. So, if you are not knowledgeable about pop culture, that is okay. But if you are, you should always be relating the things you talk about with others to pop culture in order to make yourself more charming, witty, and relatable. You will see examples of Hank using pop culture references at 1:47 and 1:57 in the video. One tip about using this technique: The more absurd you can make your pop culture references or metaphors, the better. Another advanced verbal technique that Hank Moody is a master at is creating his own new words and language. I call these “Moody-isms”. Creating your own new words that nobody has ever heard is truly THE most advanced level of verbal skills. Even verbal gods like Frank Underwood or Harvey Specter (other TV characters that excel in verbal skills that I talk about) do not normally employ this very difficult and advanced verbal technique. It takes a specific kind of person who has a carefree vibe to create new and unique words, and who if not Hank Moody, is the epitome of being carefree? Honestly, there is no consistent and reliable way to create “Moody-isms”, but I do have a few pointers for you when you are trying to do this: (i) you need to be in a carefree state of mind, (ii) you cannot care about what people think, (iii) you need to do this solely for your own self-amusement (which goes to the prior point), and (iv) a good way to do this is to use the technique of “play on words”. You will find examples of this advanced technique at 2:48 and 3:03 in the video. This article touched on the very tip of the iceberg when it comes to the verbal techniques we can learn from Hank Moody. 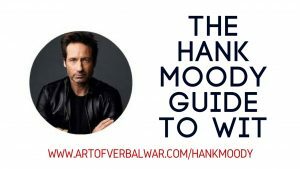 To learn more about the verbal techniques you learned in this article and the other MANY verbal skills that Hank Moody is a master at such as storytelling, absurdity, metaphoric/figurative speaking, play on words, and more, check out my forthcoming course “The Hank Moody Guide To Wit”. Click HERE or on the image below to learn more about this exciting course! 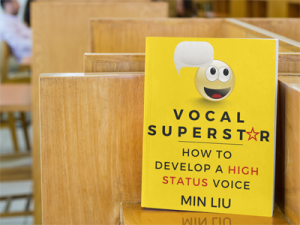 Min Liu is a corporate lawyer, Amazon #1 bestselling author, the founder of The Art of Verbal War, where people learn to EXCEL in verbal skills, and in the words of his readers, he's the "big brother you never had". Thank you Rex! Wish Californication was still on. 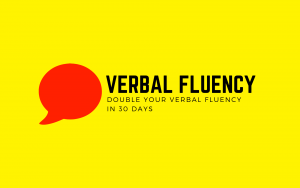 Learn how to double your verbal fluency in just 30 days. The confidence to know that your words will never betray you is waiting! Learn why conventional conversation skills advice leads to mundane and uninteresting conversations. 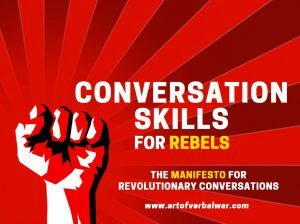 THE MANIFESTO FOR REVOLUTIONARY CONVERSATIONS will teach you eight guerilla principles for having amazing conversations. 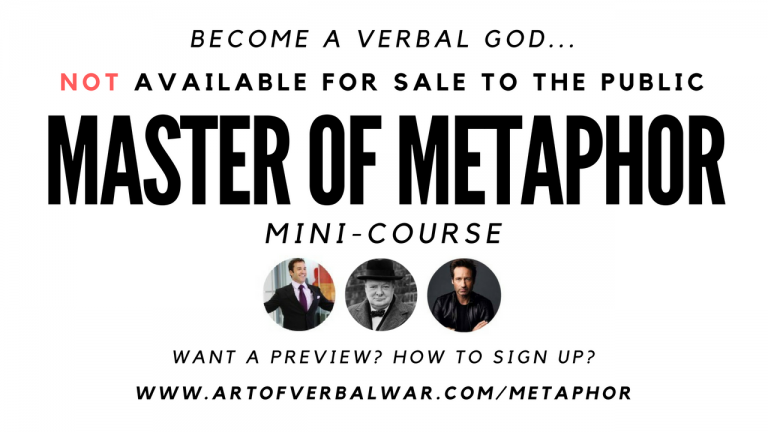 LEARN how to master metaphoric and figurative speaking and develop a golden tongue like Ari Gold, Winston Churchill, and Hank Moody! SIGN UP for a free preview and to be notified when MASTER OF METAPHOR is available next! LEARN a ten-step process to developing a high status speaking voice that immediately persuades, captivates, and grabs people's attention! 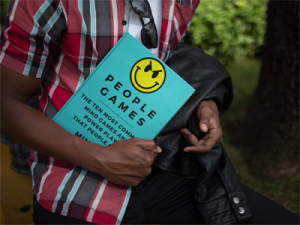 LEARN how to identify emotional manipulation and DEFEND yourself skillfully from people's mind games and power plays! Copyright 2019 Art of Verbal War. All Rights Reserved.